The world is rapidly going digital and the services attract more customers than before. This results in better sales but may also create issues for the support team. The flow of clients that have questions and make inquiries can grow regardless of the company's scale and range of services. It requires much effort to address all issues of the customers, creating the need for a conversation AI, or at least a package of pre-built scripts that can ease the burden of human workers. Although it might look like a minor issue, each unresponded question may prevent your leads from converting into paid customers. Do that too often and the growth projection will shrink. When the need to hire more customer support employees rose high, the technology offered a solution - chatbots. We will try to unearth significant aspects of technology and the way it makes an impact on business and can become useful to your business, in particular. What are chatbots and of what use can they be to your business? As was briefly mentioned above, chatbot is a machine that handles conversations with customers or random visitors. ELIZA (1966) created by Joseph Weizenbaum was the first ever program to simulate a conversation. It recognized keywords from the input and responded based on that, creating an illusion of small talk. Today chatbots are used across various industries and for different purposes. They serve as additional marketing tools, 24h support services or make the initial contact with new clients that are interested in the services. 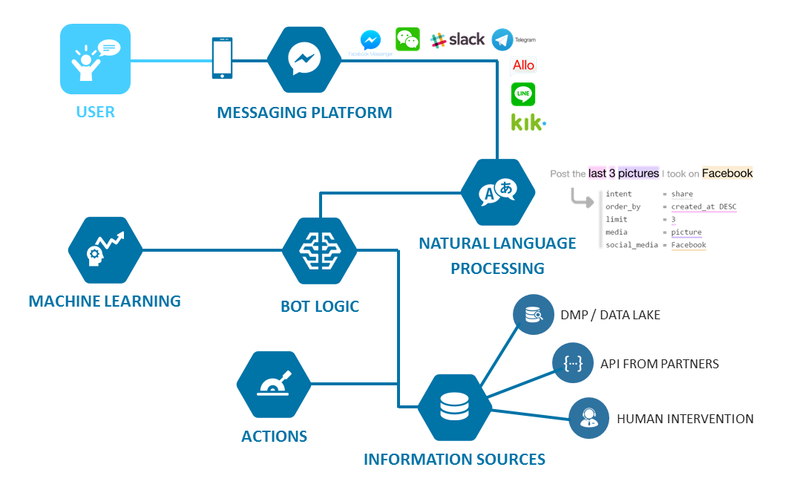 We can differentiate two major types of bots by their complexity and how they operate. Command variations of such customer assistants are simple. They operate using a set of scripts with pre-written responses. Often the companies will reveal the list of possible questions to ask the chat machine. It serves the purpose of giving the initial information to clients - working hours, location, the solution to simple (or standard) issues while using a product. It can help the customers as well as pitch the services to new people. Direct commands activate these bots. Artificial intelligence chatbots are more sophisticated programs that include machine learning capabilities. Not only such program will answer questions and aid in problem-solving, but also collect and refine the received information, training itself to be more efficient and sending the data to the analysts for further research. It is only a rough explanation of a collective image of an average chatbot. Based on industry, business owners can adjust the functionality, add new features and improve existing ones. These bots recognize the language, and there is no need to be extremely specific and correct to get a wanted result. Today we will focus on these, more advanced types of bots. The technology allows to find an existing program and utilize it or build a brand new one. This aspect will be covered in more details later in the article. AI and Machine learning advancements made chatbots a potent tool for companies. Here are some of the benefits that these programs can bring. When business scales or even one product or service becomes reasonably known, customer support employees may not be able to cope with all the questions and new customers seeking to buy. Chatbot will take care of the most of that, leaving only the most complicated issues or direct sales to human workers. Some customers may want to ask something at 4:00 am or message you from other hemispheres. Bots can take care of that and answer 100% of questions regardless of time of the day and availability of the staff. The program may turn leads into sales without troubling sales managers, leaving them for bigger fish. Chatbots are a proven marketing tool that instantly explains to customers the basics of your product, services, location, etc. E-commerce businesses use chatbots to help users learn more about specific products, choose the desired one and complete the sale within one interface on mobile devices. Fully unique experience: mobile sales have skyrocketed for the past years, and this is your chance to not miss out on a massive pool of potential customers. AI bots remember what people ask them and get better based on that. Furthermore, they send the data about a user's question to your employees. You will know what people ask about more, which product is in the most significant demand or which flaws does your service have (if any). You will have all the data at your disposal, ready to assist in making decisions that will boost the business development. Why may chatbot be an excellent investment for the future? The benefits that bots provide right now is already a big enough list of Pros, but the potential of the technology may be just a tiny bit better (or more). Over half of online sales are made via mobile devices, and their share will grow further. Chatbots are an essential part of mobile sales and services, and their popularity among clients will increase as well. Chatbots have already surpassed the apps regarding the benefits of 24h availability and quick answers to both simple and complex questions. 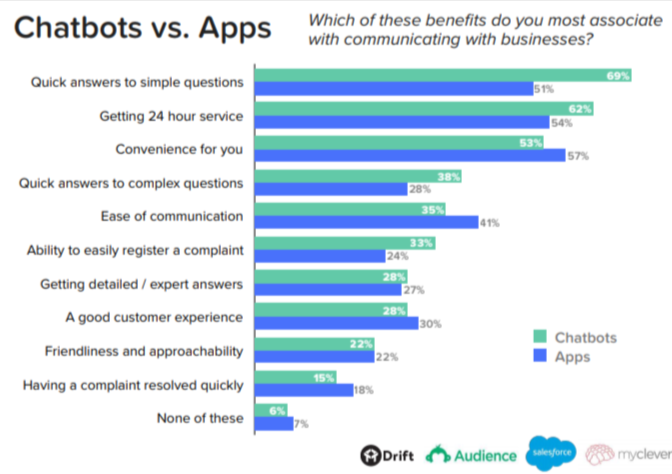 Such were the results of 2018 State of Chatbots Report by Drift, Audience, salesforce, and myclever. There is no doubt that AI and machine learning will be developed further, thus improving existing chatbots. Even better customer experience, guidance, data management, and analysis will become available. To create such a program from scratch, you first need to know its purpose. What do you want your chatbot to do? Are you willing to spend more to get AI up and running or settle for a command bot? Are you planning to sell products with bots? You need to answer these questions beforehand to choose an optimal set of skills you want your chatbot to have. Chatbot platforms allow building a bot without a massive team of skilled programmers. Chatfuel, Beep Boop, Botsify and more: there are dozens of platforms that offer various functions, and Chatbot Magazine does a spot-on job on creating the list of the best ones. If you want professional advice and assistance in building the bot, you might as well let us know - we're just one click away from here. The internet offers a wide choice of pre-built bots for various purposes. Sites like Meokay or Chattypeople provide bots that are ready to use straight away - no need to play with the code. This, however, is not the best decision to get a positive response from your business. It is unlikely that you will find a bot that will suit all your needs and won't have anything unnecessary for your niche and vision of the desired chatbot. In most cases, custom programs are the only way to get something that suits your business perfectly. Chatbots: should you get one for your business? Increase in mobile sales and customer trust towards chatbots make them worth your investments. The bots will allow to answer all questions and provide all answers to the clients, boosting your brand and generating better conversion. The bot can create a unique customer experience for each client and treat them individually based on their interests, previous actions within the platform and so on. The automated process will lift the burden off customer support team and let it calmly handle complex issues. The choice is ultimately yours, but chatbots may be your chance to boost the business and adopt technology that won’t go old soon.